I absolutely adore my thickness planer. When preparing rough stock for a new project, I often simply plane two faces of each board straight and square, and then clean up the other two faces with my thicknesser. Even though it lives at my parents’ house, but I still get to use it fairly regularly. The capacity, however, is limited to 13″ for face planing and 6″ for edge planing. This isn’t normally a problem. I rarely work with boards wider than 13″ and if I am, it’s probably because I glued up smaller board which I already surfaced individually (and jointed in reference to each other). I can then flatten and square by hand the finished tabletop (or whatever). But for pieces wider than 6″ that need parallel edges (e.g., the top of a footstool), the thicknesser just won’t cut it. 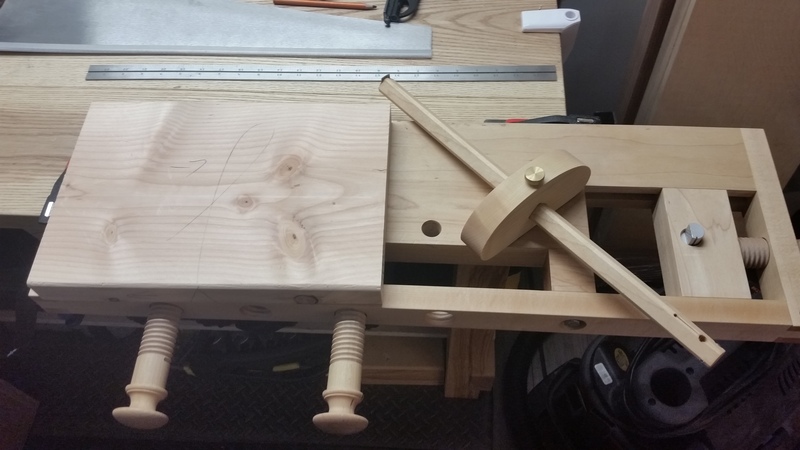 Instead, I need to scribe a line on the board indicating the desired thickness and hand plane down to that line (just like you would do for a smaller board, such as a table leg). For a long time, I had been making due with my combination square for marking thickness, but I recently splurged on a Lie-Nielsen panel marking gauge. Not sure how I ever did without one. It takes a little bit of practice to master (especially in swirling grain woods), but the panel marking gauge is a welcome addition to my tool chest (it actually lives on my benchtop). Planing down to a well-scribed line doesn’t take much more time or effort than sending a board through the thicknesser a couple times and it’s how they did it before thicknessers were a thing, anyway. I’m thinking about doing a “tools I didn’t realize I couldn’t live without” segment at some point. A panel marking gauge is certainly on my list. What about you?